Battleship Memorial Park was founded as a memorial park that honors all veterans of all wars. As you enter the park you will see memorials honoring those men and women who fought in all of our modern wars. We invite you to visit the Korean Memorial, Vietnam Memorial, complete with a standing POW bracelet, and our Fallen Guardian Memorial honoring those whose lives were lost in service to the U. S. Coast Guard. Don’t miss our poignant Service Dog War Memorial. This monument honors the dogs who served our country. Explore our Fallen Hero 9/11 Memorial that pays tribute to all the Alabamians who have given their lives in service since 9/11. Along with our memorials, some of the finest military equipment of the United States is installed throughout the grounds. Included are a M26 Pershing tank, a M48A1 Patton tank and a Vietnam PBR Gun Boat. This collection gives visitors and up close look at the United States military might. We invite you to come and explore our grounds and memorials during your visit. The newest addition to our park is a statue called The Recruit. This bronze sculpture represents all those who have taken the oath of enlistment when joining military service. 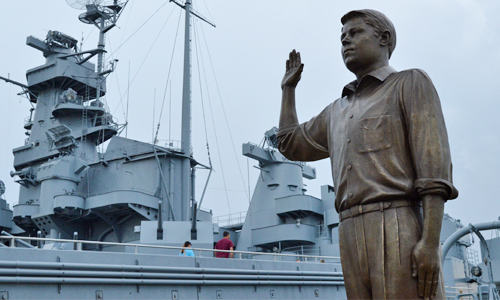 Dedicated on July 2, 2016, the unveiling began a new tradition at Battleship Memorial Park, which will carry forward every year – a community-wide Oath of Enlistment Ceremony.